In the original post this story incorrectly mentioned this Tuesday's Board Meeting the next Board Meeting is on 2/9, not 2/2. Mark your calendars the next 2 weeks for development discussions in Davidson. At next Tuesday night's (2/9) February Board meeting, commissioners will consider the proposed changes to the Historic Landmark designation for a larger portion of the Westmoreland Farm property on Davidson Concord Rd. This is in preparation the new 306 home West Branch neighborhood. Read earlier coverage on this development here and here. The meeting starts at 6pm. This Wednesday (2/3) evening sees a change to the Summers Walk neighborhood discussed at Town Hall. The neighborhood's developers are seeking a change to the master plan to remove commercial uses and make way for more townhouses. The public information session will be between 4:00 and 7:00 p.m. in the Davidson Town Hall board room. It will be an open house format with no formal presentation. The Summers Walk developers and members of the Davidson Planning Department will be present to discuss the master plan and answer any questions. Combine these two devwlopments with the giant Davidson East development and more than 800 new dwellings are in the works for the east side of town. Time to put our local mayors on a short leash? Recently, several events in the swirl of activity around the I77 HOT lanes project have shaken the confidence of Lake Norman residents. We’ve seen the Charlotte City Council throw its regional weight around by pushing the project forward in the face of overwhelming opposition from the residents most impacted by it. We’ve seen the mayor of Cornelius reprimanded by a unanimous vote of his board for supporting the project in ways that misrepresent the Board’s official opposition to it. We’ve seen the governor pass the buck and stand by watching as a political and economic disaster unfolds. In response, we've heard the common refrain of “throw the bums out” at the next election. We've heard people ask about recall votes to remove certain elected officials from office. We’ve even heard the suggestion of creating a new Lake Norman County. Unfortunately, none of those things are easy to do. Regular municipal elections are only held every two years - leaving plenty of time to make mischief between election cycles. Recall elections are not allowed by law in North Carolina. Forming a new county would require approval from the state – something not likely to come. And in the end, these solutions might not address what has been one the biggest problems locally – the unresponsiveness of our mayors. The office of the mayor serves as the face of each town. They have a lot of power and authority both inside and outside of town hall. The mayor’ offices also often serve as the initial stops where bad ideas get support. The HOT lanes project has been a prime example of this. To date, only former Huntersville mayor Jill Swain has paid any sort of political price. Mayors Travis, Woods, and Atkins are all still securely in place even though they have supported the project in various ways with the most recent example being Mooresville Mayor Atkins casting a tie breaking vote in its favor just this past week. Fortunately, solving the problem with our mayors is something within the control of the town boards and/or the citizens. Many people do not know this, but the town's have the authority to change various aspects of their municipal government charters. They can not conduct a recall election for elected officials, but they can change how officials are elected – including how the mayor is chosen. One option the town's have is to not choose the mayor by direct election, but to instead have the office of mayor selected from the group of commissioners with the “mayor” serving at the pleasure of the board. Basically, after each election the town commissioners would select which one of them would serve as mayor. The mayor would “serve at the pleasure of the board”. If the new mayor got out of line with the Board (like what has recently happened in Cornelius), the commissioners could simply demote the person back to a commissioner and replace the mayor with a different member of the board. This new process is initiated through what is called a charter amendment. The type of amendment mentioned here could be initiated by any of our town boards. It can also be initiated by a citizen petition. This may sound like an extreme example, but these type of charter amendments aren't unheard of even here locally. In 2010/2011, Davidson considered a charter amendment to go to 4 year elected terms. In 2012 Cornelius considered moving their elections from even odd years to even years. Neither change occurred, but they were considered. People are upset and looking for practical ways to impact change in our local government. Considering a change that puts our mayors on a short leash is one way to do that. Media Watch: Excuse me ma'am, but your bias is showing. In the long running back and forth between anti-toll activists and the good folks at the Lake Norman Citizen, there have been a lot of ups and downs. Usually, it involves something like an event covered differently by the Citizen, activists pointing that out, and then the good folks over at the Citizen feigning indignation and claiming to be the only news outlet in the area that is covering this story accurately. This has been going on since this story was posted back in January 2013 at aShortChronicle. Recently, things have gotten a bit more personal and more obvious however. Take this example. Earlier this month, one prominent anti-toll activist posted on their Facebook page a comment thanking the speakers at the recent Charlotte City Council meeting for their efforts. These speakers were called "heroes". Somewhat oddly, staff writer Lori Helms from the Lake Norman Citizen chimed in saying that was an inappropriate use of the word "hero". It seemed like an odd comment, but then again everyone is entitled to their opinion. Now, to be very clear, Ms Helms did not say she was speaking on behalf of the Citizen or anything like that when she joined the conversation. However, someone else on the thread subsequently brought up what they thought was Ms Helms's biased reporting and Ms Helms said this in response. That would seem to be pretty clear wouldn't it? No bias, EVER, in news stories and commentary stories are just COMMENTARY. Now, fast forward to the very next week which just also happened to be the very next issue of the Citizen. Check out this news story on the recent LKN Chamber annual awards gala and this commentary piece on the idea of a new Lake Norman county. In the rundown of awards in the "news" piece, two awards were glaringly missing. Both WidenI77.org and the I77 Business Plan organizations received Distinguished Service awards from the LKN Chamber for their efforts to stop the HOT lanes project. The entire list of awards is on the LKN Chamber website. Moreover, the Lake Norman Citizen was the sponsor of the event! It would seem pretty likely they had access to the entire list. A more glaring and literal example of bias by omission in a news story would be hard to find. Now go read the commentary piece. The editor of the Citizen rakes Charlotte Observer columnist, Mark Washburn, over the coals for suggesting the the LKN area consider pushing for it to become its own county. Again, this is just the writer's opinion (based on a level of research) and everyone is entitled to their own opinion. However, the aggressiveness of the editor's opinion and the high degree of snark with which it was delivered brings to mind the saying "tell us what your really think." After reading that, I think it is safe to say the public knows. When an editor allows a "news" piece into a publication with such a glaring ommission on a story where the ommission involves groups involved in the largest ongoing story in the area, and in that same edition the editor blasts away in a commentary piece involving that same issue, it's pretty easy to see why some in the area think the publication is "in the tank" on that issue. For the record, this post - as are all posts at aShortChronicle - is just a piece of COMMENTARY. Please don't confuse it with NEWS. Mooresville Mayor repeating history with vote on HOT lanes project? The saying "if we don't learn from history we are doomed to repeat it" could not be more true after last night's vote in Mooresville to approve the I77 HOT lanes project. 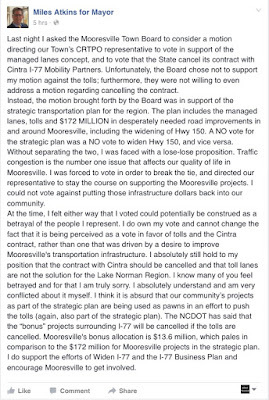 In a 3-3 tie vote, broken by Mooresville Mayor Miles Atkins in favor of going forward with the terribly flawed Cintra contact, Mooresville voted on Tuesday to support the CRTPO long-range transportation plan that includes the horribly unpopular toll project. The critical CRTPO vote came Wednesday night where where it also passed. The situation in Mooresville on Tuesday was eerily similar to the 2007 vote where former Mooresville Mayor Bill Thunberg cast a tie breaking vote that effectively created MI-Connection - the money losing cable company owned by Mooresville and Davidson. That vote effectively ended Thunberg's elected career when he narrowly lost reelection in 2009 once it started to become apparent MI-Connection was going to be a financial disaster. 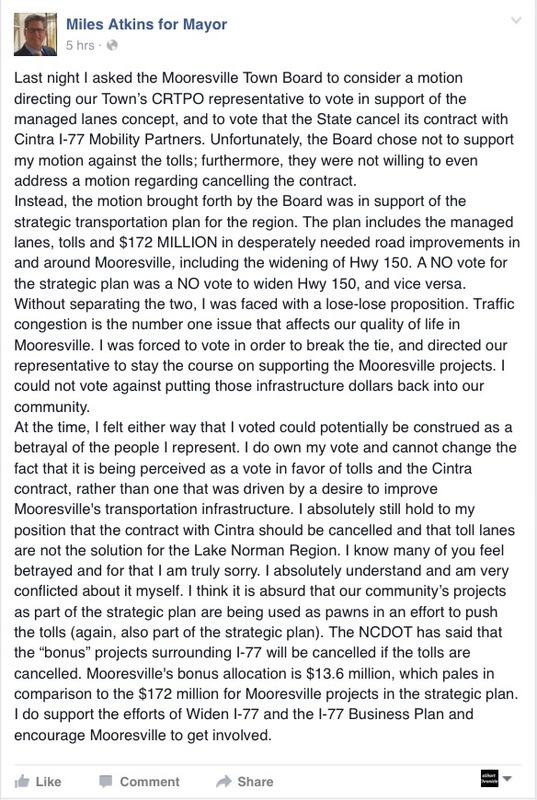 Here is Mayor Atkins's post on his Facebook page to explain his tie breaking vote. What do you think voters will say next time he has to face them? Town should.take transparency to the next level. It is that time of year again – time for the annual request for our local town governments to be as open and transparent as possible. In last year's New Year’s resolution column three requests were made of the towns – improve email collections for public records requests, follow the spirit of the law (not just the letter of the law) when it comes to open meetings, and respect the will of the voters when it comes to filling vacancies in local town Boards. While none of the towns passed ordinances that explicitly addressed these, incremental changes could be seen in positive directions on all of them. So, in the spirit of starting the new year off on a positive note, here is something a couple of or towns did which improved transparency that was not even on last year's list. This past August Davidson began live streaming of its public meetings using UStream.tv -becoming the first of the North Meck towns to offer this to citizens. To date, the various videos have received a total of almost 1000 views. That may not seem like much, but when you consider that most meetings are relatively dull having few if any citizens attending, having video available does make a relatively significant difference. If nothing else, it makes it easier for the media to accurately report on what happened. The real difference is made when there is something of high community interest. For example, the video of the community meeting on Davidson’s controversial Downtown Catalyst Project received 226 view - proving that video availability significantly improves the reach of Town Hall when there is something people really want to see. An added bonus is that this service is very economical. Hosting the live streaming, which also allows for commercial free viewing, costs the town only $99/month. Soon, Davidson won't be the only local town to offer video of its meetings. One of the first items approved by Huntersville after the last elections was to set up a similar service. With many new faces on Huntersville’s Board, this certainly will be a good new way for residents to put “faces with names” and get familiar with the new leaders. Adding video is definitely a positive step for transparency. But…you knew there was a “but” didn't you? There is always more work to be done when it comes to shining light on the public’s business. Here are two policies all town boards could implement easily to ensure as much openness as possible. 1. Require each elected official to copy a central town “public records” email box on their communications. This can easily be done and is particularly important if an elected official ends up communicating what should be a public record on a private eat I account. Town Clerks are responsible for being the keeper of a town’s public records. Their jobs should be made as easy as possible and they should not be forced to try to always track down messages from individual officials. 2. Each town should implement firm policies or rules of conduct outlining exactly when elected officials and even advisory board members should publicly disclose if they might have even the perception of a conflict of interest. The State law is very specific about when elected officials can be recused. It is much less often than one might think, and it leaves plenty of room for people to rationalize away why they might not need to recuse themselves from voting or participating in a discussion. Town policies making it very clear when something should be disclosed would go a long way to strengthening public trust. At the very least, making that thought process less ambiguous would let citizens know when someone was not following policy. All of the activism that has gone on around various issues during the last year has stated to improve things at the most local level when it comes to transparency. Taking these two steps would be a sign the town boards are serious about taking it to the next level. After Monday's vote where Charlotte City Council decided to snub North Mecklenburg and participate in the cramming of the HOT lanes down the throats of LKN voters, talk is already turning to "payback". One area that had been previously mentioned was a possible second attempt at repealing the county's transit tax. Theoretically, a repeal of the tax would leave the transit chieftains at CATS (a department of the City) without a mechanism to pay for building more trains. The City would be on the hook for paying for mass transit all by itself without help from the burbs. North Meck and the other suburbs were promised rail transit when the 2030 plan was originally put together and then again during the 2007 repeal effort. Those promises have turned out to be lies, and the thinking goes that a second attempt may have more success. Having been heavily involved in the failed 2007 effort, I'd have to say this is going to be a heavy lift. However, if done right and with more finesse, it's possible. I have been a faithful bus rider since before the last repeal effort. The reason repeal is a good idea is because the transit plan is fundamentally dishonest (just like the HOT plan), and was doomed to fail from the start because of its focus on rail rather than buses. A repeal effort that forced the City away from its self serving rail plans towards buses could be pulled off. The Observer at least seems concerned about the possibility, posting this editorial on Wednesday. A second area where suburban rebellion might be seen is more unexpected. That's with CMS's upcoming student reassignment plans. While not directly related, Charlotte's actions Monday night threatens to pour gasoline on what was already a smoldering fire. Like almost all urban areas, Charlotte struggles with its schools. CMS has large numbers of schools with high concentrations of poverty - mostly within the city limits. One way to "fix" that problem is to shift students around by manipulating student assignment in various ways - usually at the expense of the suburbs. This tension comes to the surface every time CMS has to look at its boundaries about every 6 years. Check out this article and its comments from Thursday's Charlotte Observer. It is clear that the HOT lanes decision will be boiling over into this high-stakes process as well. With many more people now understanding that Charlotte only gives lip service to the idea of regionalism, push back against its bullying could and should be more aggressive. Charlotte's divisive leadership may be about to reap what it has sown. The drumbeat of development keeps pounding in Davidson, and as has come to be expected, nothing is ever straight forward. Prior to implementing any plan the current owners of the property are pursuing a change to the current “historic” designation for a significant portion of the land. That's where things get interesting. Readers who follow developments in Davidson may remember that during the long debate over the rewrite of the town's planning ordinance, the Westmoreland Farm property was one of the most contentious pieces. In fact, from previous discussions with Davidson Commissioner Rodney Graham, the change in the designation of this property from “Rural” to “Neighborhood General” was a primary reason he ultimately voted against the entire rewrite – feeling it did not do enough to protect this large amount of open space. The old “rural” designation required 40% open space for new development while the new “neighborhood general” designation only requires 20%. However, the specific geography with this property implies the actual open space would be significantly greater than the 20% minimum due to the presence of a large amount of flood plain on the property as well as something called a “viewshed” for the historic Beaver Dam House across Davidson Concord Road. It's this viewshed which will take center stage as this project kicks off. According to Wikipedia, in urban planning viewsheds “tend to be areas of particular scenic or historic value that are deemed worthy of preservation against development or other change.” That definition definitely applies to the eastern end of the Westmoreland property. There's just one problem. When the planning work began, it was discovered that the actual officially protected viewshed area is in the center of the property – and not really in the main view of the Beaver Dam House at all. 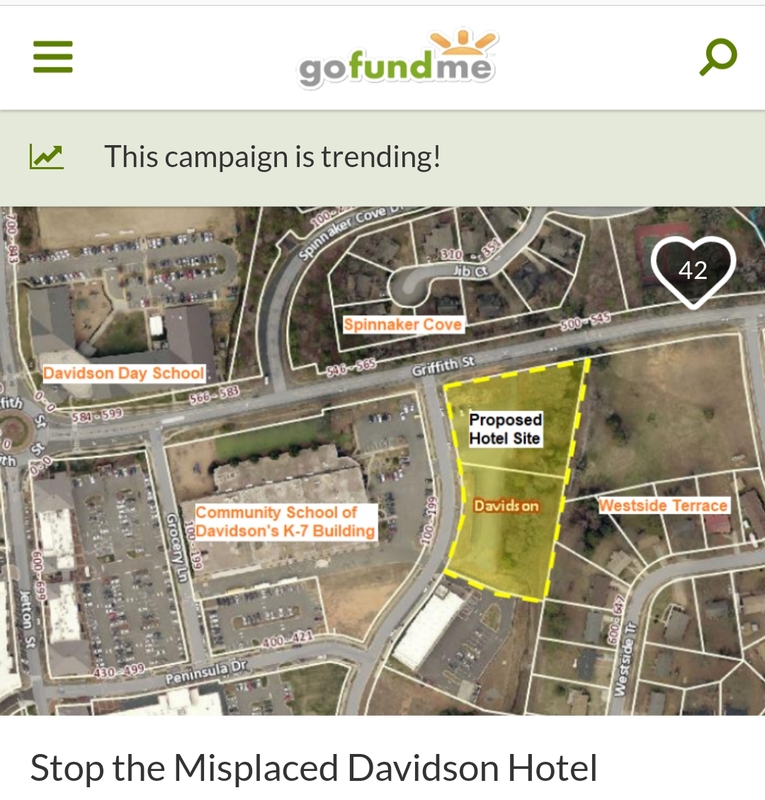 To that end, Davidson resident Susan Irvin who is representing the Westmoreland family has been working with the Mecklenburg Historic Landmarks Commission to get the viewshed changed from its current 39 acres to a significantly expanded 59 acres covering the eastern end of the property. That's the good news. What could possibly be considered less than good news by some is that this “viewshed” designation does not really protect the land from development. The Landmarks Commission included a portion of the Westmoreland property in the historic designation for the Beaver Dam House back in 1979 upon request, but the development protections likely apply only to the house itself. The Commission is not in the business of protecting raw land as an organization like the Davidson Lands Conservancy would do, so technically, any land not within flood plane could likely be developed even if it was in this “historic” designation. In the end though, all of this may not matter much for those most concerned about preserving meaningful open space in town while still allowing development. Per information provided by Irvin, the upcoming plan will likely have approximately 50% open space across the entire 169+ acre site – open space that includes both this new viewshed area as well as open areas within the planned development. At 50%, this amount should more than satisfy all but those who want to see zero new development in town. If you are interested in learning more, there will be a public hearing at the next Historic Landmarks Commission meeting this coming Monday, January 11th. The meeting starts at 6pm and will be a the HLC offices at 2100 Randolph Road in Charlotte. Assuming the HLC approves the change Davidson’s Town Board will also have to approve at a later date. In the event this occurs, Davidson Commissioner Brian Jenest has already confirmed he will ask to be recused from voting. Jenest’s firm, ColeJenest&Stone, who is doing the design work for the development. As said earlier, things are always interesting when it comes to development in Davidson. UPDATE: The town planning department says the application for West Branch has been received and will be up on the site here by late Friday or most likely Monday. Big week for I77 tolls issue...buckle up! This coming week will be big - maybe the biggest in the 3-year saga of the anti-toll movement fighting the proposed I77 HOT lanes. In just 1 1/2 days this past week, activists raised nearly $10,000 from over 150 donors to place an ad in the Sunday Observer. 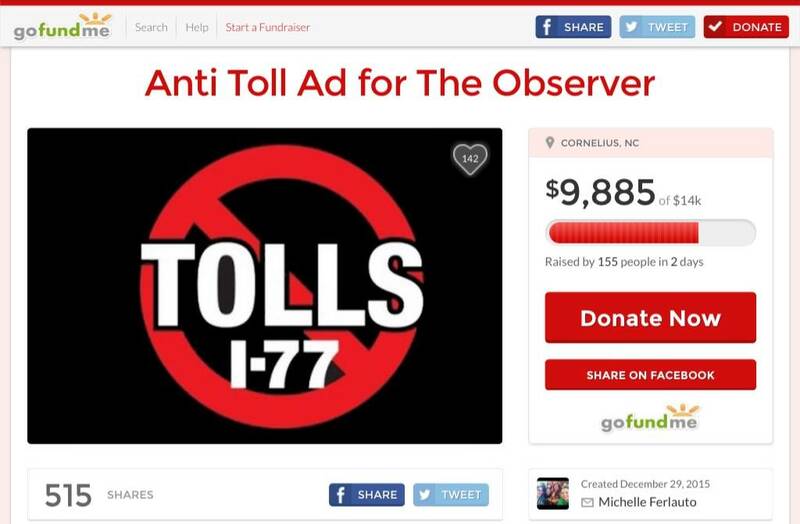 The ad intends to educate the Charlotte region on the toll issue. 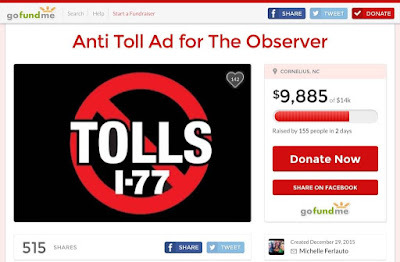 "This fund is to pay for an ad in the Charlotte Observer to inform the citizens of Charlotte about the specifics of the toll road controversy as many are completely unaware. Private citizens are supporting their own effort to inform the general public as many elected officials, along with the NCDOT are not forthcoming with the details that affect the lives and communities in this region." This type of ad should combat the pro-toll propaganda being put out by NCDOT/Cintra and broaden the reach of the anti-toll movement . The fundraising campaign was led by activist Michelle Ferlauto of Cornelius. Due to deadline issues, as of this writing it is unclear whether or not it will be this Sunday (Jan-3) or next. Regardless of when this hits the presses, it is highly impressive that an impromptu effort like this could be so successful during the holiday season. "Thank you Michelle Ferlauto for all you have done on this! Even though the timing didn't work out perfectly, this is just an incredible show of support by our community." And that support will be needed this coming week. On Monday, Jan-4, Charlotte officials will be discussing the upcoming vote on the project at CRTPO planned for later this month on Jan-20. With Charlotte carrying 46% of the vote on that body, its position is critical. Bookending this coming work week will be the long-awaited leagal hearing in the WidenI77.org effort to stop the project. The group is encouraging people to head down to the Mecklenburg County Courthouse FrIday morning as a show of support. The group is looking to pack the 100 seats available. Here are the details. January 8, 2016 at 10:00 a.m.
Carpools are also being formed at all Lane Norman exits if anyone needs a ride. Buckle up! This week could be a wild ride.